Figure 1, Browser view of watched plant. Monitor you plant remotely with browser, watch webcam image and observe temperature and humidity graph. Decoctus is the name for this small system that helps to grow a plant. With help of a sensors the plant can be monitored remotely and watched its well-being. 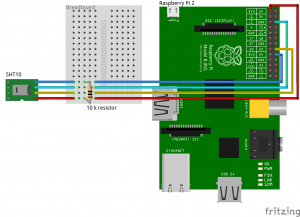 The core of this system is Raspberry Pi microcomputer. It controls SHT10 humidity & temperature sensor and a webcam, additionally it hosts a Node.js web server and acts as storage for collected data. 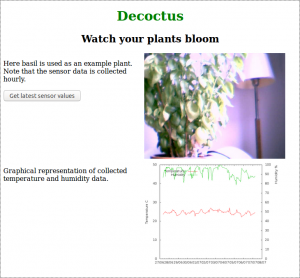 A web browser is used to show the sensor data in graph form and and the latest photograph of the plant. For monitoring environment of the watched plant SHT10 temperature and humidity sensor is coupled to Rasberry Pi 2 GPIO pins. The pi-sht1x library of Keito extracts data from the sensor and converts to human readable form, into Celsius degrees and relative humidity percentage. About wiring the SHT10, take a look of figure 3. From sensor wires go through a breadboard to enable power and data wires to pass 10K resistor. Green wire is ground and it is coupled to a GPIO ground port, here third down from the right. Blue is the data line used for readings, coupled to ninth at right row, physical port number 18 or GPIO 24. Above it is the yellow clock wire at port port 16, that is GPIO 23. And the fourth red power wire is first in left 3,3V port 1 or GPIO 01. 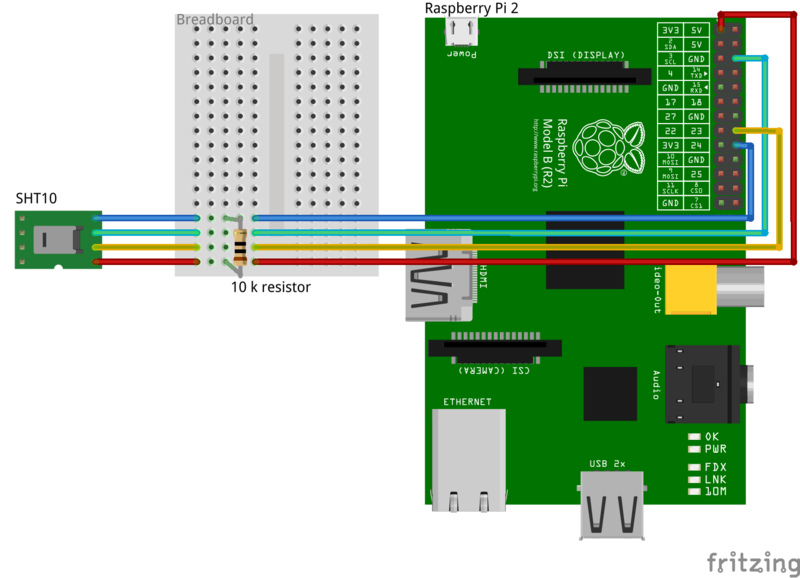 Figure 3, sensor wiring though a breadboard to GPIO pins. dataline = dataline + Math.floor(Date.now() /1000); //Timestamp from milliseconds to seconds. 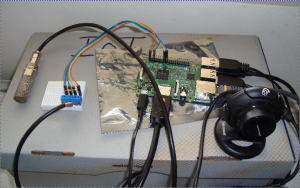 The used controller is Raspberry Pi 2 Model B, installed with Raspbian Jessie operating system. In server, here is the same Raspberry again, there are two server processes, continuous web server and hourly executing data collection process. 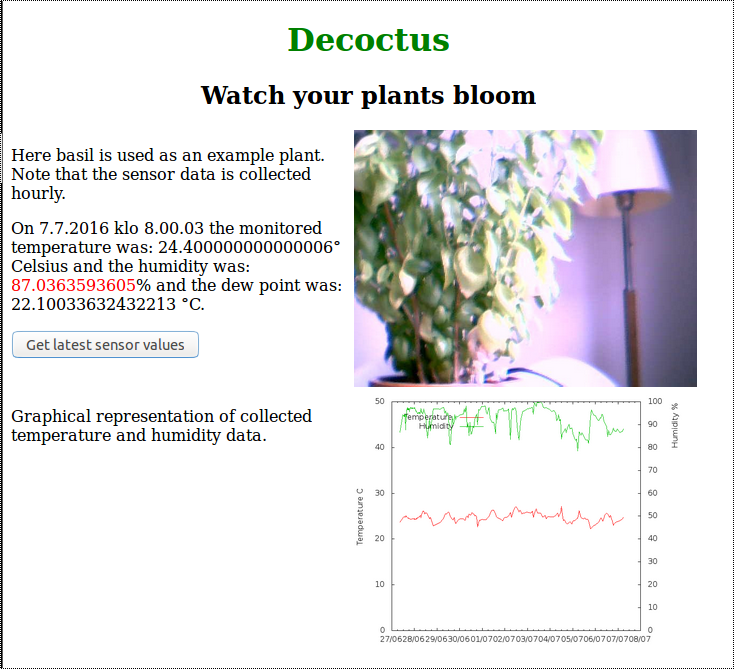 The web server is implemented with Node.js tuuttuut.js code as well as SHT10 sensor data saving with sensordata.js program. Data saving is initiated with Cron through keraa.sh bash script. Because there is not used any web softaware framework here is also part of systems directory structure. And keraa.js launch senor data collecting, webcam shooting and plotting of newest sensor data grap with gnuplot. #does not run the node script from cron without giving paths, here right one should be just added. #And fetch data from sensor sht10. For Node.js server tuuttuut.js to serve a html file, images and text for AJAX text, following code is used. //First getdata returns empty line???? In figure 4, it is possible to see the parts of system web page. There is the latest, at most an hour ago grabbed photo of the watched plant, the graph plottet when the photo an sensor value was taken and a button to get the last sensor readings. Colour ofreading s are red if beforehand given limits are passed. In the system here is index.html page from where next AJAX code is taken. Maybe there is too much on Raspberry, web server data collection and data. And everything without any backup, first development need is to take backups. Later maybe copy whole image to cloud and separate data storage. Next change AJAX to some library that allows server push data, then draw the graph on canvas whenever data has been updated. Then add to the keraa.sh script deleting jpg files, just leaving weekly samples maybe. Here is also gnuplot script. set key left top title " "
For using computer vision to automatically detect transformation in a plant it is possible to use Node.js with openCV library. And start like in this code here. This entry was posted in Yleinen on 7.7.2016 by Liisa A Lado-Villar.